Here's a prime example of a Hollywood B-melodrama, originally released here as the support to Alec Guinness's Father Brown. Director Richard Quine's first thriller (he made the excellent Pushover the same year), this tautly paced Columbia action tale reminds us of what a talented film-maker he was, and how underrated he is today. The style may be a little drawn-out for contemporary tastes, and star Mickey Rooney's tendency to chew the scenery has not worn well. But Dianne Foster is an attractive foil, and familiar faces Kevin McCarthy and Jack Kelly add the appropriate grit in supporting roles. Quine would later cast Rooney brilliantly as Jack Lemmon's "Mr Fixit" in the hysterical Operation Mad Ball. Crime drama starring Mickey Rooney and Dianne Foster. 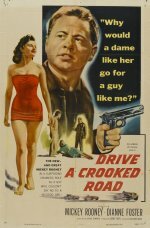 In search of a quick getaway from a planned heist, two bank robbers approach car mechanic and ace driver Eddie Shannon. But honest Eddie wants no part of their scheme that is, until seductive Barbara Mathews appears on the scene.